I am a member of an elite group of National Yo-Yo Masters. To learn more about what it means to be a Yo-Yo Master, or to learn about the history of yo-yos, check out the box below. The title of "Yo-Yo Master" is awarded for the dual attainment of being recognized as an exemplary player and a progressive leader in the development of future players. 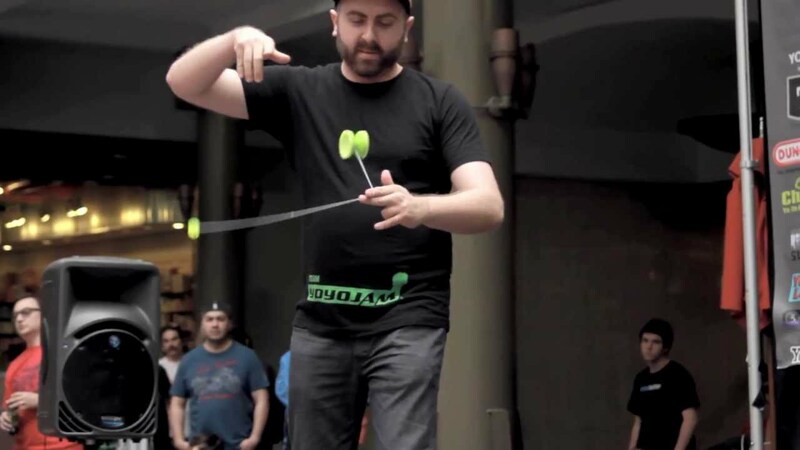 The directors of the National Yo-Yo League select these masters based on skill, dedication, and their ability to teach and spread the sport of yo-yos around the world. 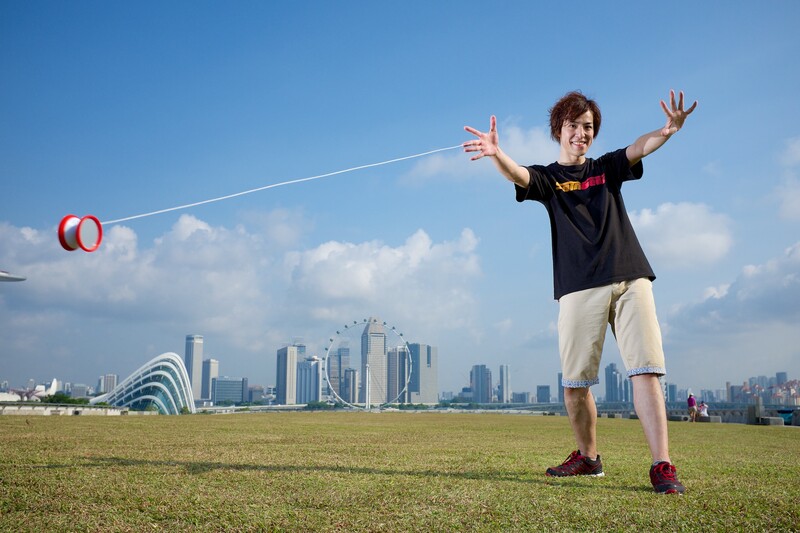 Although many people have claimed to be a yo-yo master, there are only 16 Official Yo-Yo Masters worldwide. Four of them have been elevated to Grand Masters. The National Yo-Yo Grand Masters are the people who have contributed to the Yo-Yo community for their entire lifetime. They have continually given back to the sport for many years making an incredible impact that changed the face of yo-yos! The National Yo-Yo Masters are people who have contributed greatly to the Yo-Yo community. Through performance, teaching, judging, or everyday awesomeness they have significantly impacted the yo-yo community at one time or another. -Entertaining audiences around the world since whe was 8 years old. -Featured entertainer at the White House, Euro Disney and Universal Studios. -Honored in both the Vermont and Hawaii State Senates for her accomplishments in the yo-yo world. The Hall of Fame page is currently under-construction. I am trying to keep the history of the yo-yo alive, if you have any significant information on these players please send me the details. This process was used from 2002-2008 to select members to the Hall of Fame. To read more about each person, click their name below. Dennis began his yo-yo career at the age of eight, and as a child earned more than 15 yo-yo titles. In 1995 the American Yo-Yo Association (AYYA) honored Dennis with the title of U.S. National Master, in recognition of his lifetime of exemplary dedication to yo-yo play. In 2001 the AYYA honored him with the title of U.S. National Grand Master, an honor he shares with only three other players in the world. In 2006 the organizers of the World Yo-Yo Contest honored Dennis and his late wife Carol with the "Harvey Lowe Lifetime Achievement Award." In 2007 Dennis was inducted into the AYYA Hall of Fame. Over the years Dennis has been a guest performer with the Mickey Mouse Club Mouseketeers and "Yo-Yo Man" Tommy Smothers. 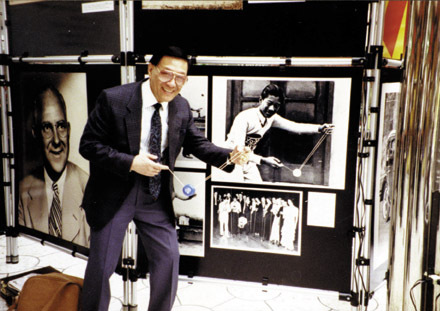 His first professional yo-yo performance was in Walt Disney’s first 3-Dimensional movie, which played exclusively at the grand opening of the Mickey Mouse Club Theater in the Disneyland theme park in 1955. 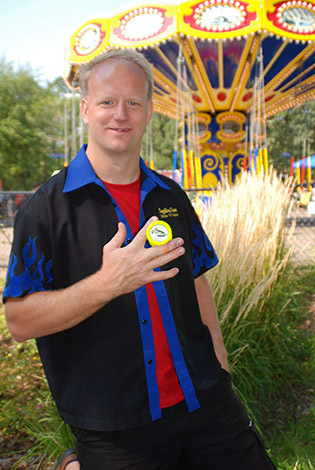 Since then, Dennis has performed on behalf of the Disney Studios, Disneyland, the Disney Channel, Mars Candy Company, Mattel Toy Company, Bandai Toy Company (America, Japan, France, Korea, & Taiwan), Six Flags Corporation, Duncan Yo-Yos, BC Yo-Yos, Yomega Corporation, and numerous other companies worldwide. 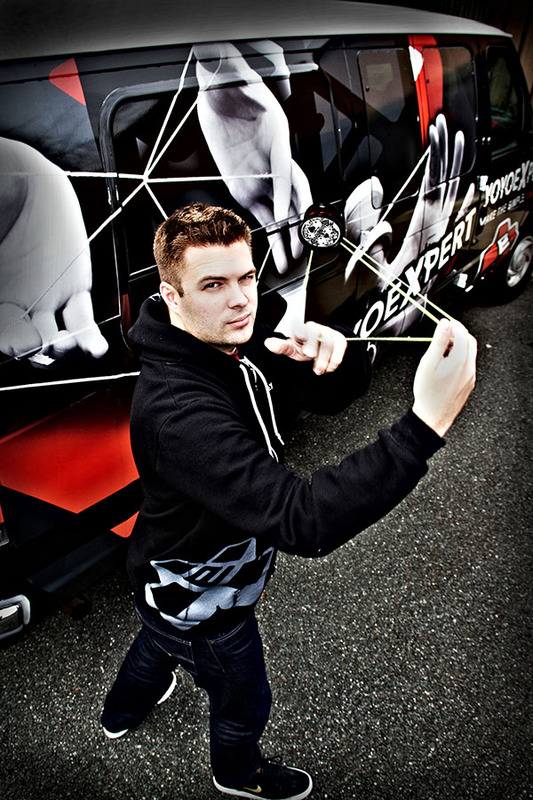 Additionally, he has produced and starred in nine instructional videos to help promote the art of yo-yo play. Dennis’ USA television credits include numerous appearances on the four major US networks (ABC, NBC, CBS & FOX), as well as appearances in special programs on Nickelodeon, ESPN, the Discovery Channel, and the FOX Kid’s Network. He has also been a guest on television programs and film documentaries in France, Korea, Hong Kong, and Japan. In the late 1990's Dennis traveled throughout the United States and internationally, presenting his "Dare to Dream ~ Dare to Do" motivational school assembly to hundreds of thousands of young people. When he’s not performing, Dennis enjoys teaching younger players and helping judge yo-yo competitions such as the World Yo-Yo Competition and U.S. National Yo-Yo Contest. He has also lent his judging expertise to the Japan National Competition, French National Competition, and various state and local competitions throughout the United States. Dennis is deeply grateful for all that the yo-yo community has contributed to his life over the years, and especially for the many wonderful friends he has made along the way. Dennis and his wife Lynda reside near Solvang, California. Gus Somera made himself a legend as a yo-yo demonstrator, not based on skill and amazing performances, but on a commitment and congeniality for his chosen profession. Although known to many as Gus Somera, his real name was Sotero Parpanea, using Somera as his lifelong performing name. An immigrant from the Philippines, he was one of the original crew of Duncan Filipino demonstrators recruited by Pedro Flores in the early thirties. Somera's career spanned six decades as a yo-yo demonstrator working not only for the Donald F. Duncan Company but also for Duncan/Flambeau. His longevity as a demonstrator was only overshadowed by his likability. Somera was always willing to make the effort to carve an island scene on a yo-yo or spend a little more time with a student until the trick was mastered. All that speak of Gus Somera remember his good nature and patience with them as they were trying to become skilled at the yo-yo. He was described as a pied piper with the yo-yo. His constant companion and working partner was his Brother George Somera and together their promotions and contests impacted hundreds of thousands of children interested in acquiring yo-yo skills. Their constant touring over the entire country led Somera to be quoted as saying "There is not a city of any size in this country that I don't know my way around in". Gus Somera died at the age of 82 in 1990. 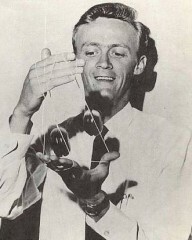 Joe Young was one of the first yo-yo demonstrator stars. From Regina, Canada Joe Young picked up the yo-yo for the first time in 1931 winning a Cheerio sponsored citywide contest. His non-stop practice resulted in a skill level far superior to other players and he was asked to tour Canada for the Cheerio yo-yo company. The earliest known existing film footage of a yo-yo demonstrator is that of Joe Young. Joe became Cheerio's Golden Boy of the yo-yo. Considered the best player in Canada, Cheerio formed a team of Joe along with Harvey Lowe and Gene Mauk to introduce the Cheerio yo-yo craze to Great Britain in 1932. Harvey and Gene were great, and now legends, but Joe was the star. Joe preformed for the Prince of Wales and Amelia Earhart and the press loved Joe. Joe Young's "Yo-Yo Lessons" were printed in the papers as promotions for upcoming contests. Joe repeatedly fended off staged challenges to his "World Title". The "World Champion" that Harvey Lowe beat out in 1932 was none other than Joe Young. Joe continued to play the yo-yo until his death during WWII. Linda Sengpiel was the first female professional yo-yo demonstrator. Being the top female yo-yo player for nearly 4 decades she was commonly referred to as the “First Lady of Yo” She began demonstrating professionally for Duncan, Royal and Pedro Flores. She was Pedro Flores only demonstrator in the ‘50s. During these years she was known as the Yo-Yo Queen. Later, she considered herself an entertainer rather than a demonstrator. One of her most noteworthy exploits was a 10,000 dollar challenge to her audiences to anyone that could do her ten trick routine. The prize was never collected. The Sengpiel supersonic yo-yo pack from the ‘70s is a staple in most yo-yo collectors’ collections. She continued to perform and judge at contests until her death in 2001 at age 57. The Linda Sengpiel Award is given each year at the World Yo-Yo Contest to a female that demonstrates excellence in yo-yoing. 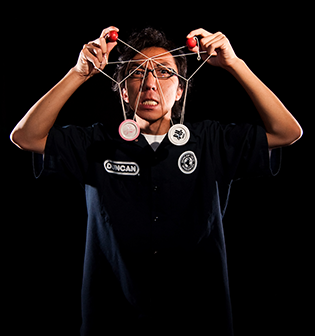 Joe Radovan, a Filipino immigrant, got started in the yo-yo trade through the Duncan Yo-Yo Company as being part of one of their earliest crew of yo-yo demonstrators under Pedro Flores. He toured the world with Duncan and was promoted as a Duncan World Champion. In 1937 Joe Radovan left the Duncan Company and began his own yo-yo company, The Royal Topps Manufacturing Company. He continued to promote yo-yos for Royal until the early 1980s. Radovan loved the yo-yo and although he had other promoters that helped with his Company, largely Joe Radovan was the main promoter for Royal yo-yos. Radovan had designed patents for yo-yos which were produced and over the decades produced scores of different yo-yos which are highly sought after by yo-yo collectors. The Royal Company still produces limited edition yo-yos through Joe's son, Tom Radovan. 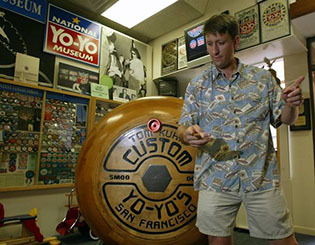 Tom Kuhn, a San Francisco dentist, is best known amongst yo-yo players and collectors as producer of high quality wooden yo-yos. In the 1970s he came up with a unique yo-yo design, a take-apart yo-yo, the no jive 3 in 1. 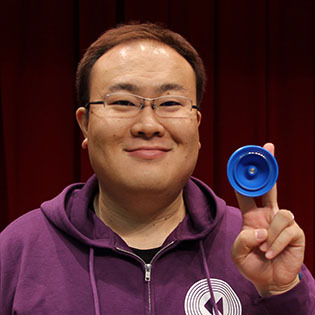 Since that time multiple other yo-yos have been created by Kuhn and he has received several yo-yo patents. In 1979, he produced the largest functioning yo-yo, at the time, with a 50 inch diameter and weighed 256 lbs. which was operated from a crane. In 1981, this yo-yo was listed in the Guinness Book of World Records. One of his yo-yos was also used by jeweler, Sydney Mobell, which was imbedded with 75 diamonds, 75 sapphires, 25 rubies and 25 emeralds. The selling price of the yo-yo was $10,000. Tom Kuhn yo-yos continue to be produced and are a favorite of both collectors and players alike. 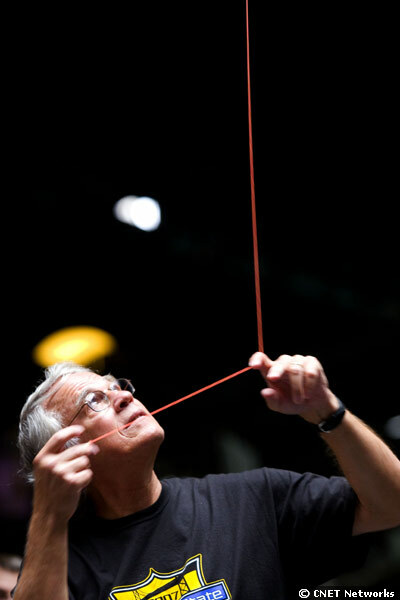 Dale Myrberg began his yo-yo career demonstrating for Duncan in 1954 at the ripe old age of 13. By the age of 15 he was the top player in Utah. Following a hiatus of nearly twenty years he picked up the yo-yos again and never looked back. Demonstrating for Duncan and Hummingbird he found he preferred entertaining over demonstrating. In 1988 he preformed on the Smothers Brothers Show along with yo-yo legends, Harvey Lowe, Barney Akers and Bob Rule. He organized the return of the Utah State yo-yo championships in 1989. 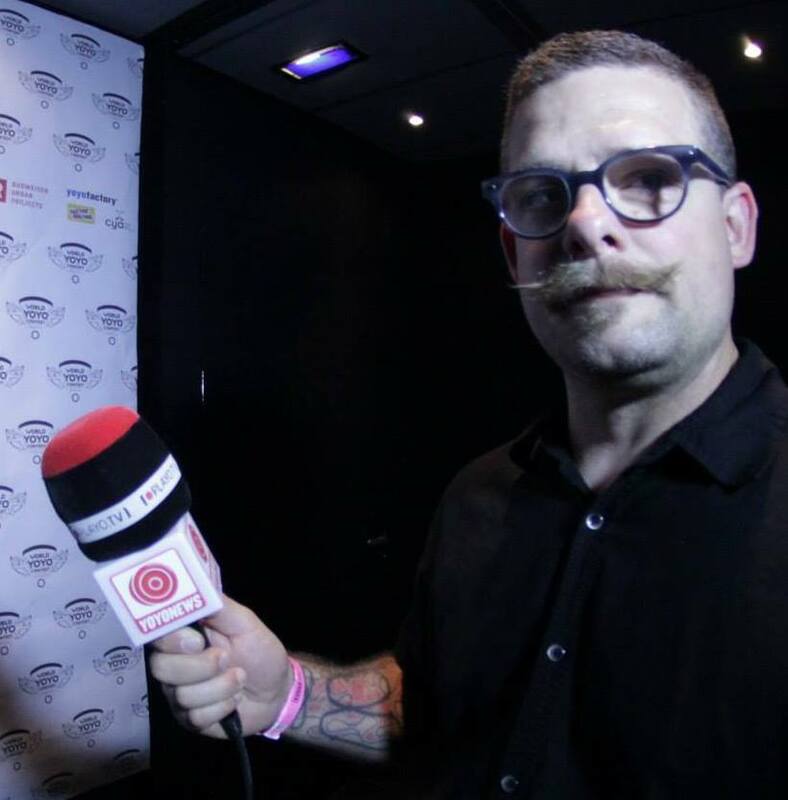 He was runner up in the first modern world yo-yo championships held in Montreal in 19992 and later won the world championships in 1996 (the oldest person to win a world title). At one time he held six AYYA open world records, the most any one person has held at once. He has generously given his time in support of the yo-yo movement virtually never missing the nationals and world championships which he has been a frequent judge. In 1995 he was one of the first three to be honored with the National Masters title and in 2001 he was elevated to the title of National Grand Master. 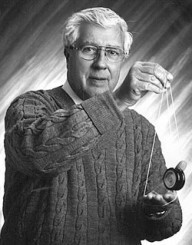 Harvey Lowe was one of the first Yo-Yo demonstrators for the Cheerio Yo-Yo company of Canada. 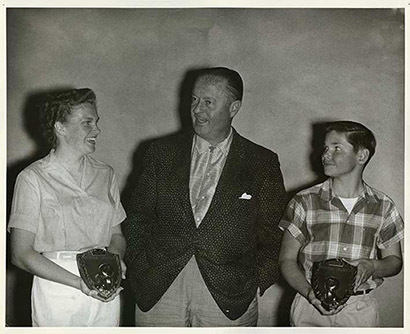 Harvey at age 13 won the 1932 World Yo-Yo championships hosted by Cheerio in London, England beating out the legendary Canadian Joe Young. It has been said that his hands were insured by Cheerio for $150,000. Since that time he has continued to play and demonstrate the yo-yo. He has made multiple television appearances including the 1989 Smothers Brothers special which featured several legendary yo-yo players. He made many appearances in the "Return of the Yo-Yo Traveling Show" in 1990. He has also made an appearance in the movie (documentary) "Who is Albert Woo." 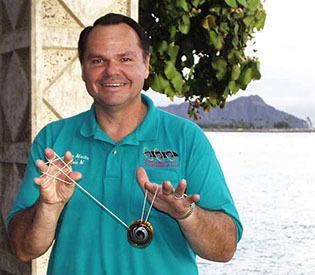 In 2000 he was honored as the grand Marshal of the world yo-yo championships. Dale Oliver started with Duncan as a part time pro in 1955. In 1957 he became a traveling pro and has been a yo-yo professional ever since. 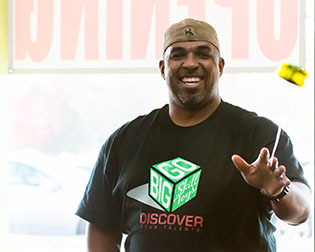 He founded his own yo-yo company, Oliver Toys, in 1995 which is now known as Spintastics and has developed a school program, "Yo-Yo Fun and the Science of Spin" which teaches yo-yoing to more than 40,000 children a year. A true dynamo, Oliver, over the years has set world records, been a world champion, been recipient of the "National Master" Award, founded the A.Y.Y.A. and has been instrumental in the development of the World Yo-Yo Championships. 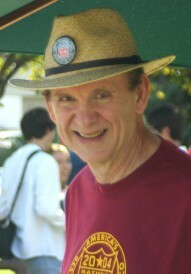 Bob Rule, as with many demonstrators, got his origins from the Duncan Yo-Yo Company where he started as a part time employee under Barney Akers and later became a full time professional. In 1960 Rule took the promotional name “Mr. Yo-Yo,” which became well known. Upon the demise of the original Duncan Yo-Yo Company (Bob was the last demonstrator on Duncan’s payroll), Bob continued to promote the yo-yo through the Festival Yo-Yo Company where Bob was their sole demonstrator for a number of years. 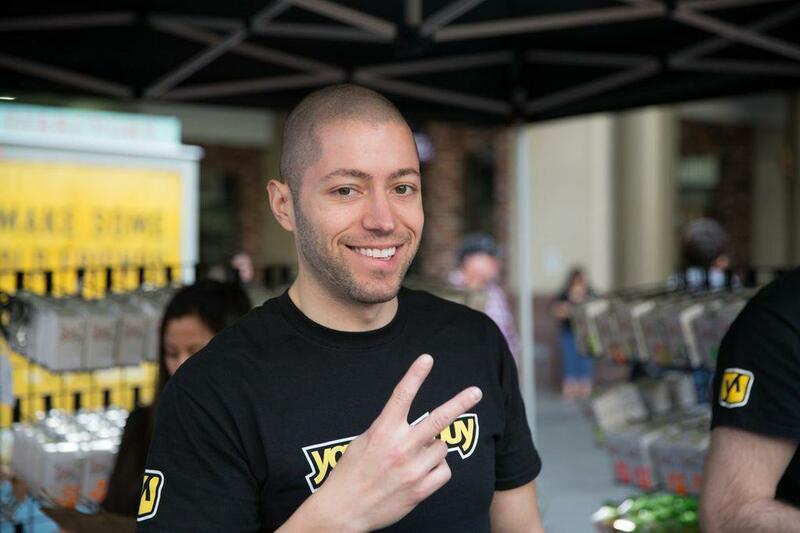 Bob has continued to support the yo-yo through play, collecting and through his website (mryoyo.com) and continues to make appearances at yo-yo events. 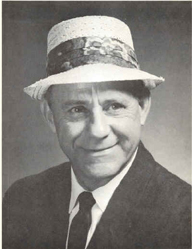 Duncan, Jr. took over the helm of the Duncan Yo-Yo Company in 1957. At the time, the Duncan Yo-Yo was the most recognized brand of yo-yo in the world and dominated yo-yo sales producing 85% of all yo-yos being sold in the United States. 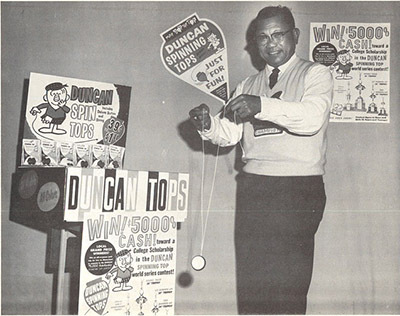 Duncan continued to maintain the company’s market leadership and in 1962 the company produced up to that time the largest yo-yo craze in America by introducing paid television advertising. In 1962, Duncan sold more than 45 million yo-yos. In its peak production, Duncan was producing 60,000 yo-yos per day with 640 employees. 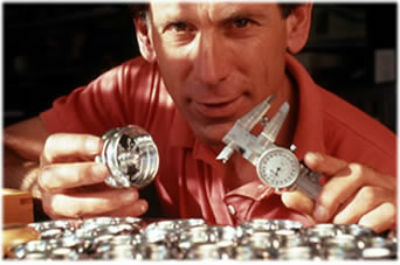 After the closing of the plant in 1965, Duncan had a several year hiatus from manufacturing his yo-yos. In 1974 he again reentered the market producing the Pro-Yo under the Duracraft name and then changing the name in 1987 to PlayMaxx. Duncan was a founding board member of the American Yo-Yo Association. Duncan and his wife of 50 years, Donna, died in an auto accident on June 12, 2003 in New Mexico. Jack Russell, the founder of the Russell Yo-Yo Company, began his yo-yo career as a Duncan demonstrator in the 1940’s. In the 50’s, working with Duncan, Russell put together a foreign promotion division called DRI. He later parted with Duncan and formed his own company which produced the Russell Yo-Yos from 1958 and continuing to this day. Although not as widely recognized in North America, foreign Russell/Coca-Cola yo-yo promotions have made the Russell yo-yo the most recognized selling yo-yo worldwide. During the late sixties, seventies and early eighties when few yo-yo promotions were being held in North America, Russell contests flourished in other areas of the world. The Russell Yo-Yo Company continues to produce and promote the yo-yo through his sons. 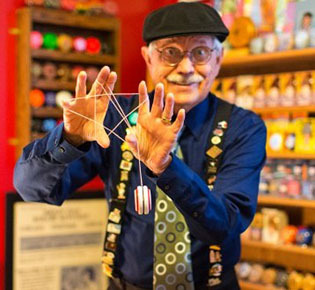 Barney Akers was one of the most well known and revered of the Duncan Yo-Yo demonstrators. 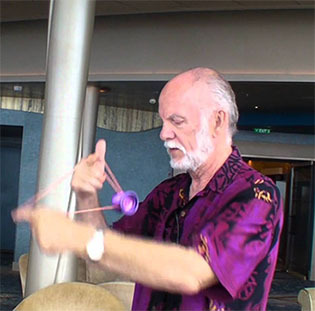 Akers demonstrated the Duncan Yo-Yo for decades and was considered one of the best players of his time. He may have trained more professional demonstrators than any other individual in the art of the yo-yo. Akers had his own style of play and players who learned from Akers were often called “Barney players” as his particular yo-yo style was very apparent. In addition to his hands on demonstrating, Akers was featured in a Duncan demonstration films, had multiple television appearances and personal appearances. He continued to play the yo-yo throughout his entire life. 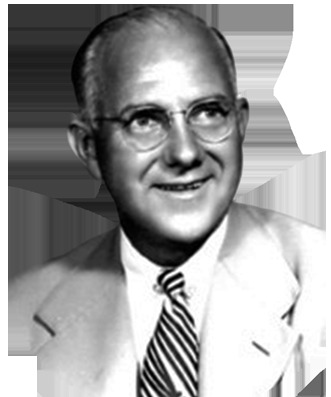 Don Duncan, Sr., described as an entrepreneurial genius by many sources, was the President of the Duncan Yo-Yo Company from its inception in 1929 through 1957. The Duncan Yo-Yo Company controlled the yo-yo market from the late ’20s through 1965 with approximately 85% of all yo-yo sales in the United States being Duncan Yo-Yos.Duncan promotions made the word “yo-yo” a household name throughout the United States and other areas of the world. 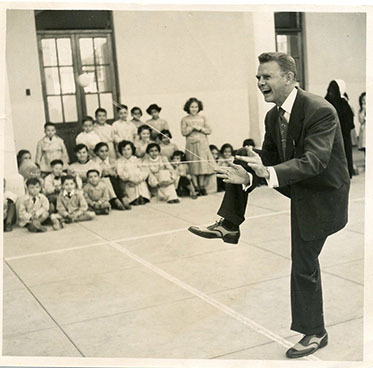 His brilliance in the promoting arena resulted in throngs of young boys participating in yo-yo contests across America. 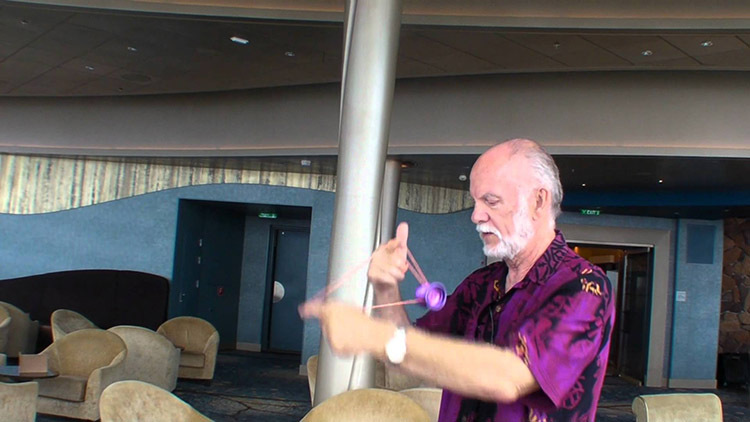 His use of yo-yo demonstrators popularized the toy as never before seen. Duncan Yo-Yo contests became almost a “rite of passage” for young adolescent males in the 1930’s, ’40s and ’50s. Several generations have fond memories of the “Duncan Yo-Yo Man” returning to their town each summer hosting neighborhood contests. Many of the great leaders in the yo-yo community had their beginnings as demonstrators for the Duncan Yo-Yo Company. Pedro Flores is considered by many to be the “Father of the Yo-Yo” in the United States. It was Pedro Flores, a Filipino immigrant, who introduced the word “yo-yo” to the United States and began producing yo-yos trademarked by that name in 1928. 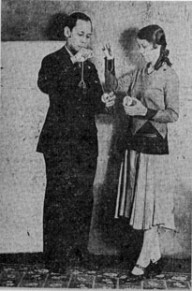 Introduction of the “Flores Yo-Yo” created the first American yo-yo craze and Flores is also credited with holding the first yo-yo contest in America in 1928. In the late ’20s Flores’ yo-yo companies were producing thousands of yo-yos. Pedro Flores ultimately sold the Flores “yo-yo” trademark name to Donald Duncan in 1930 but Flores continued to promote the yo-yo under Duncan in the early ’30s. Flores also coined the phrase, “If it isn't a Flores, it isn’t a yo-yo” which was then used later by the Duncan Yo-Yo Company to describe their yo-yos. Flores yo-yos are some of the most highly sought after yo-yos by collectors. After leaving Duncan in the ’30s, he reportedly set up the Bandalore Company which briefly made the Bandalore Yo-Yo. After World War II, Flores helped Joe Radovan establish the Chico Yo-Yo Company and demonstrated for Radovan using Chico and Royal Yo-Yos. In 1954 he started the Flores Corporation of America which briefly produced another line of Flores Yo-Yos. 1. Electors - Only active members of the AYYA shall be eligible to vote. 2. Eligible Candidates - Candidates should be, or should have been, an active participant in the yoyoing community. They can be a player, promoter, manufacturer, inventor, or any other contributor to the yoyoing community. 3.1. AYYA Screening Committee - An AYYA Screening Committee will be appointed by the AYYA Board of Directors. This Screening Committee shall consist of not more than six members. The duty of the Screening Committee shall be to prepare a ballot listing in alphabetical order eligible candidates who: (1) received a vote on a minimum of five percent (5%) of the ballots cast in the preceding election or; (2) are nominated by any two of the six members of the AYYA Screening Committee. 3.2. Active AYYA Members will vote for no more than five (5) eligible candidates deemed worthy of election. Write-in votes are not permitted. 3.3. The candidates receiving the top two (2) total number of votes cast by the membership as well as any candidate receiving votes on seventy-five percent (75%) of the ballots cast shall be elected to membership in the AYYA Hall Of Fame. 4. Voting - Voting shall be based upon the persons contributions to yoyoing, playing ability, integrity, sportsmanship, and character. 5. Time of Election - The duly authorized representatives of the AYYA shall prepare, date and include the official ballots with the Spring issue of the AYYA Newsletter in each year in which an election is held. The member shall return the completed ballot within thirty (30) days. The vote shall be tabulated by the duly authorized representatives of the AYYA. 6. Certification of Election Results - The results of the election shall be certified by a representative of the AYYA and a member of the AYYA Board of Directors. The results will be released in the Fall issue of the AYYA Newsletter as well as on the official AYYA website. 7. Amendments - The Board of Directors of the AYYA reserves the right to revoke, alter or amend these rules at any time. Copyright © 1995-2006 American YO-YO Association, Inc. The American Yo-Yo Association has been the group to organize and test the World Yo-Yo Records since its inception in 1993. The record database was lost and off-line for many years, but with the help of key people in the industry, we have pulled them back together at the link below. If you know of any omissions or errors, please contact me and I will fix it.